Beat People with a Stick! Still stuck at the same old level? Get UNstuck. Play the best pool of your life, starting now! currently offered in various cities in the US. 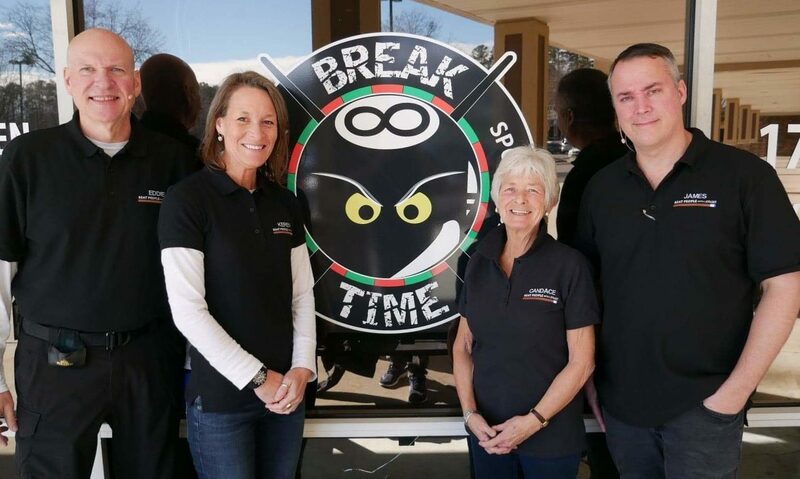 Instructors and staff, decades of play and teaching. accredited by the PBIA since 2004. Hundreds of testimonials and reviews in publications and websites. Thousands of happy, improved players. Tom Simpson founded the National Billiard Academy. He is also the inventor of Elephant Practice Balls, Ghostball Aim Trainer products, and the Stroke Groover. Tom Simpson was the inventor of multiple pool products and wrote hundreds of billiard articles and publications. The National Billiard Academy is the only school authorized to teach the specialized Aiming Systems of Hal Houle. Several thousand players have been trained and over 200 new instructors produced since 1995 through the National Billiard Academy. Most players are stuck at some level because their fundamentals are not strong enough to allow them to progress. The NBA is dedicated to developing & maintaining a solid foundation of good fundamentals. Over 25 years of helping players play waaayy better! The Intensive is our “boot camp” for billiard players of every level. After 25 years of refinement, we feel this is the best pool player training program available. It doesn’t matter how long you’ve been playing. This is the true – and often surprising – billiards foundation every player needs, taught by highly experienced, full–time pool instructors. We identify & correct your form flaws. We all have some, we’re typically not aware of them, and they are what’s holding us back. To play better pool, you need a simple, precise, consistent setup and stroke that works with your body. You need clear, physics-correct understanding of ball behavior, and practical methods for finding perfect aim. You want to enjoy the game more, and play with dignity. We promise this, and more, will happen for you. Visit our YouTube Channel to hear more about the Intensive Pool Clinic, events, and other helpful tips! Visit the POOL SCHOOL page to learn more. Helping players play WAAAYY better! 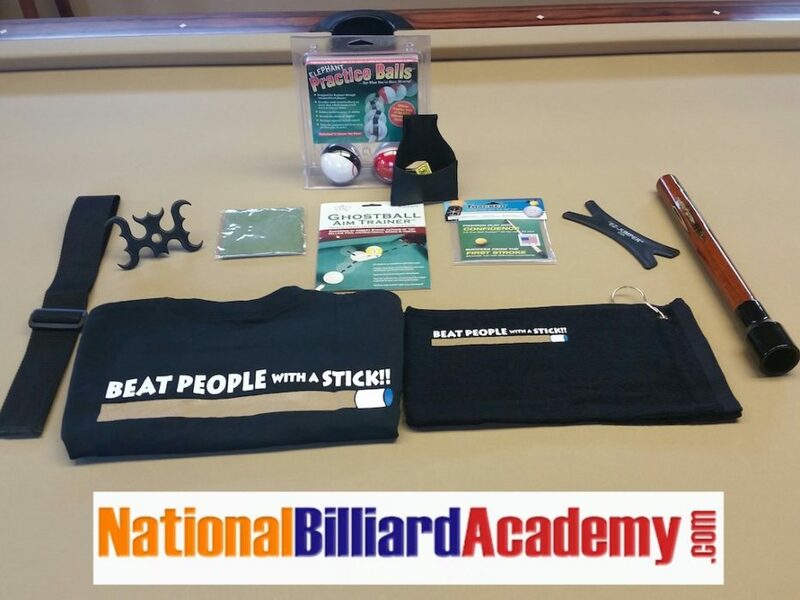 Tom Simpson founded the National Billiard Academy (accredited by the PBIA since 2004). With more than 100 years combined pool playing and over 25 years teaching, National Billiard Academy is THE premier, accredited pool school. The NBA has trained over 3,500 pool players and certified over 200 instructors. Our pool school offers billiard lessons for every skill level. We’ve been evolving and refining the National Billiard Academy 3-Day Weekend Intensive for over 25 years now. It’s the real deal. Your pool school experience will give you the tools, skills, and knowledge to break you through whatever is holding you back. You’re welcome to check out more Comments from Players here at the website. Tom was the founder of Elephant Balls, Ltd., and invented the Elephant Practice Balls and Ghostball Aim Trainer products, used worldwide since 1994. Practice Balls are available at this link, directly from the source; there is a limited quantity available as they are no longer manufactured. Tom’s training aid, the Stroke Groover, was tested extensively in pool school. See a video of this terrific product in action. Beat People With a Stick! is Tom’s book of 129 instructional columns, presenting 20 years of Tom’s best work. The lesson book offers clear instruction & key insights for every player. Click for more info. We are the exclusive distributor for the original Jerico Stinger Cues. The Pro Stinger is the world’s best jumpbreak cue. These cues are endorsed by seven PBIA Master Instructors, and are being used by top pros. Try one for 30 days. You’ll be astonished! Click for more info. Click here for an article by Tom about how to become a better pool player. Click here for Tom’s article about finding your Pattern of Missing, and click here for the corresponding Excel worksheets. For current prices and schedules call or email today. Get the 2019 schedule & pricing for the Intensive Pool Clinic.